Deviled eggs are high on the list of American classics that never go out of style. We love that they feel retro and modern at the same time. 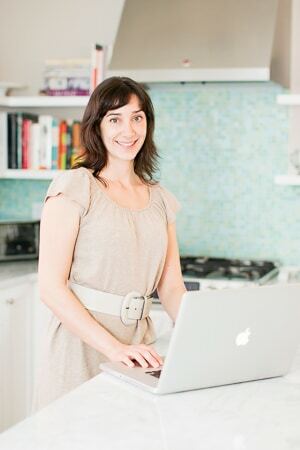 Umami Girl is all in on the deviled egg bandwagon. We have recipes galore, tips and tricks for the best deviled eggs, and lots more. So we thought it was high time to throw a deviled egg party. 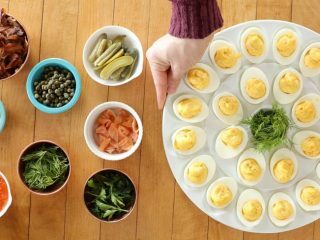 Setting up a deviled egg bar is a great way to make classic deviled eggs into a beautiful DIY event at your next party. Think brunch buffet, cocktail party, Easter, Mother's Day, and beyond. 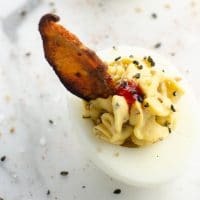 We tend to use our extensive list of deviled egg recipes, below, for inspiration on what toppings to include, but eggs are so versatile that you can easily riff on these ideas and include whatever looks great at the market. We love our deviled egg serving plate, which keeps the eggs stable and looking their best. You can also use a regular serving platter and just go ahead and nestle the eggs up close to each other so they stay put. For toppings, an eclectic mix of little bowls is fun. How cute are these, for example? Don't forget to include small serving utensils for toppings where appropriate. For serving, place a stack of small plates and a stack of napkins at the start of the buffet, near the platter of eggs. You might consider including some forks as well, depending on the toppings you choose and how you think they — and your guests — will behave. For all of our deviled eggs, we start with the best eggs we can find. This is a good choice for both taste and environmental impact and can also be a nice way of contributing to the local economy. Regardless of what you choose, we like to use large eggs for deviled eggs. 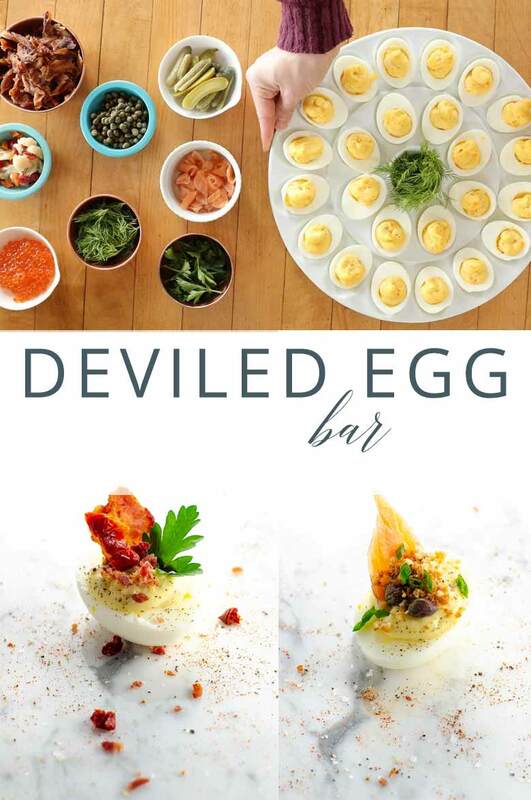 For a deviled egg bar, we start with our classic deviled eggs recipe and figure on one to two whole eggs per person, depending on the crowd and what else we’re serving. All of Umami Girl's best deviled egg recipes — from classic to crazy — in one place. Here's how to make deviled eggs in the classic style, amped up slightly with a powerhouse ingredient. Classic deviled eggs are a crowd-pleasing buffet item. 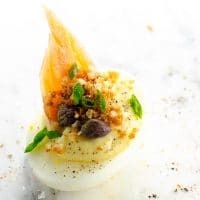 The Niçoise Deviled Egg is a super-savory, totally fabulous mashup of two classic dishes: deviled eggs and salade Niçoise. 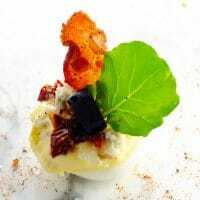 BLT Deviled Eggs are a showstopping (but super-easy!) twist on two beloved American classic recipes. Here's how to make this crowd-pleasing buffet star. Crowd-pleasing herbed deviled eggs are a great party starter. They're full of flavor (and protein!) and perfect for a springtime buffet. 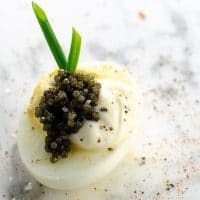 Oh hi there, fancy deviled eggs with caviar and creme fraiche. These special bites are just right for elegant parties, from weddings to NYE to awards shows. 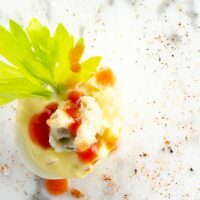 Our giardiniera deviled eggs recipe is a super-easy and super-flavorful deviled egg idea and a quick variation on classic deviled eggs. Here's how to do it. 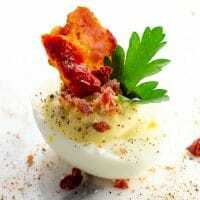 Cobb salad deviled eggs combine the flavors of two American classics into one hands-down buffet star. They're just shy of unruly in the best possible way. 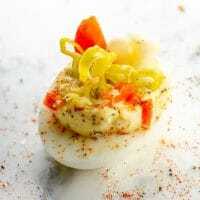 Buffalo deviled eggs are an easy, fun, crowd-pleasing variation on classic deviled eggs. They work well fully dressed or as part of a deviled egg bar. 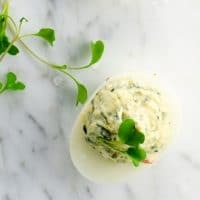 Spinach dip deviled eggs may be the easiest among creative deviled eggs ideas, but boy are they good. Satisfy two classic American cravings at once. 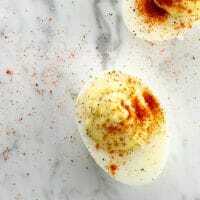 Delight your guests and your tastebuds with our umami-forward ultimate miso deviled eggs. These two-bite wonders are packed with satisfying savory flavors. Bagels and lox deviled eggs are an absolute brunch dream, combining two of the best brunch buffet items in the multiverse. Not to oversell them or anything. 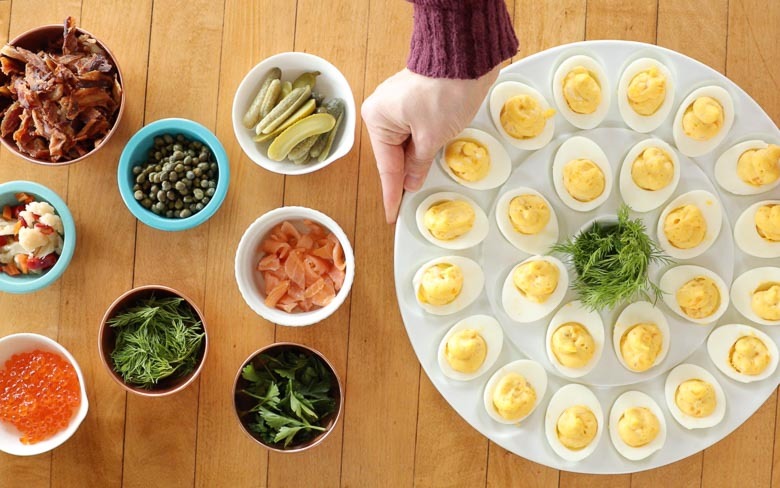 Here's how to put together a show-stopping deviled egg bar for your next party. 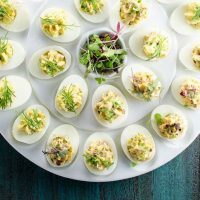 A deviled egg bar can be the main component of a buffet or one of many, depending on the size and nature of your party. The only limit here is your imagination, so have fun. Prepare one or two batches of classic deviled eggs, depending on the size of your party and what else you're serving. Figure on one to two whole eggs per person depending on circumstances. Set them out on a serving tray near the beginning of the buffet line. Set out toppings in small bowls. Be thoughtful about grouping ingredients together so as not to give your guests analysis paralysis, and also about setting out serving utensils where needed. Sauces like sriracha can stay right in the bottle, as long as it's been reasonably well maintained. Place a stack of small plates and a stack of napkins at the start of the buffet line. Depending on your toppings, you may want to include forks as well.